Running is a relatively simple sport, put on your shoes and shorts and go, but to have success at a grueling race like the Zumbro 100, Midnight 50 or 17 mile races, you will need a few things, mo matter how minimal you like to travel. Twin Cities Running Company carries the best selection of specialized trail and ultrarunning gear in the Twin Cities, heck the Midwest for that matter. Weather you prefer hand-held water bottles, a waist-pack or a full on hydration / running vest TCRC has you covered – they carry the gear for you to check out in the store before you buy (one of the pitfalls of shopping online). This is the same thing with their shoes – Magazines like Ultrarunner, Trail-Runner and Running Times do a great job of featuring the latest and greatest trail running shoes, but what a disappointment to go into a running store and find that they only feature a model or two – this is not that case at TCRC, they have a full wall of trail running shoes, they not only carry the traditional major manufacturers like Nike, Asics, Adidas and Brooks trail offerings, they have a huge selection of Scott, Salomon, Inov-8 and many more! That’s all for now… now you know where to go to gear up for this years Zumbro Endurance Run. 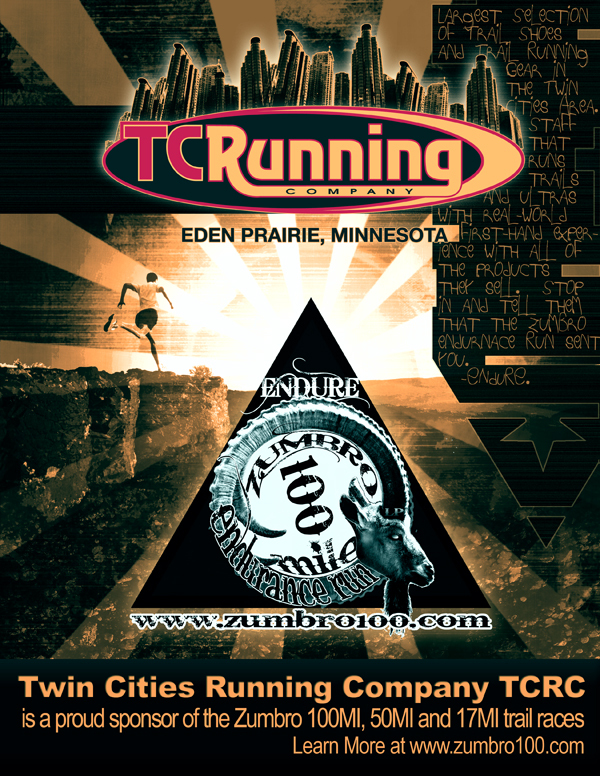 Visit the Twin Cities Running Company Website HERE and enjoy the hospitality at the TCRC RV aid station at the race (Bridge Aid Station / Aid Station 1/4). Chase the Ibex.